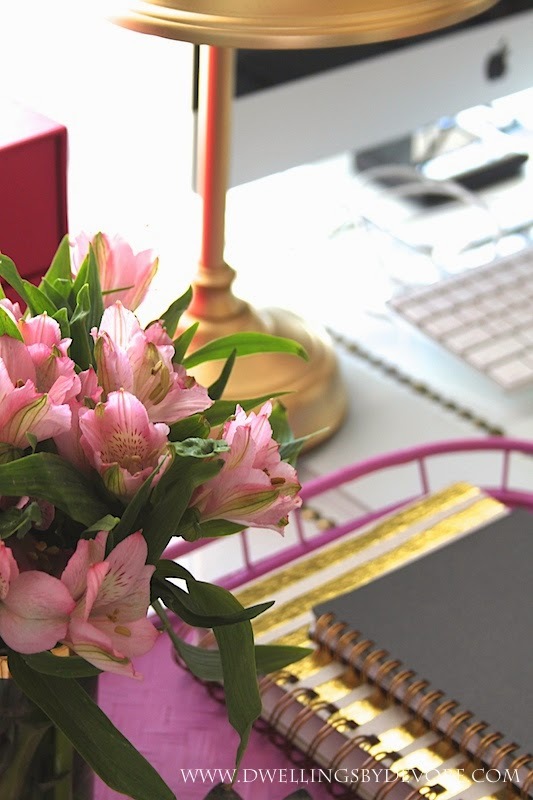 I'm so excited to be sharing a fun project today with some of my favorite bloggers! We all worked on a project centered around radiant orchid, the color of the year. I know radiant orchid hasn't been the most popular color of the year, but I really like it. I probably wouldn't paint a whole room that color, but I think it's a great accent color in small doses. My office is lavender with accents of pink and orange so I thought that would be the perfect place to throw in a little radiant orchid. I started with this tray that I found at Goodwill. I see them there all the time. Then I just picked up a sample pot of radiant orchid from Lowe's. A little goes a long way so I have a bunch leftover for other projects. 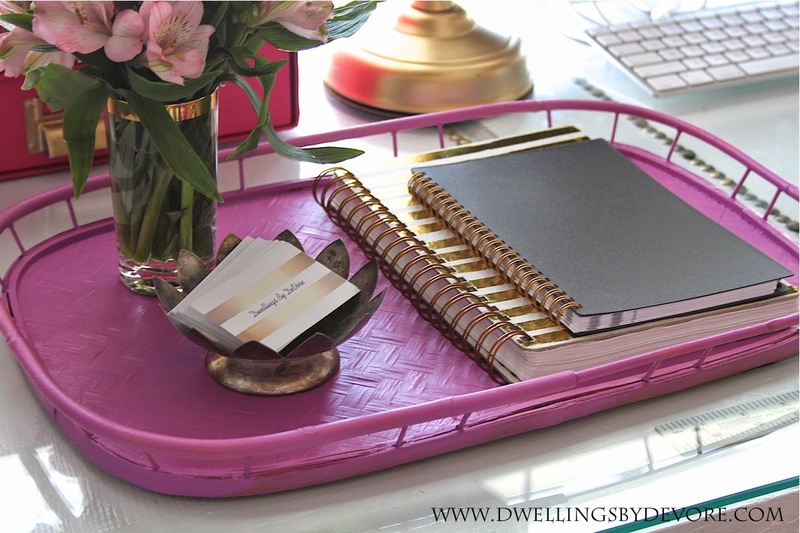 I really like the way this color pops against my white desk and the tray is great for keeping things a little more organized. What do you think about radiant orchid? Would you use it in your home? Be sure to check out the other projects through the links at the top of the post! I just love it so much that color! And your tray looks so pretty! Those flowers are perfect for it! 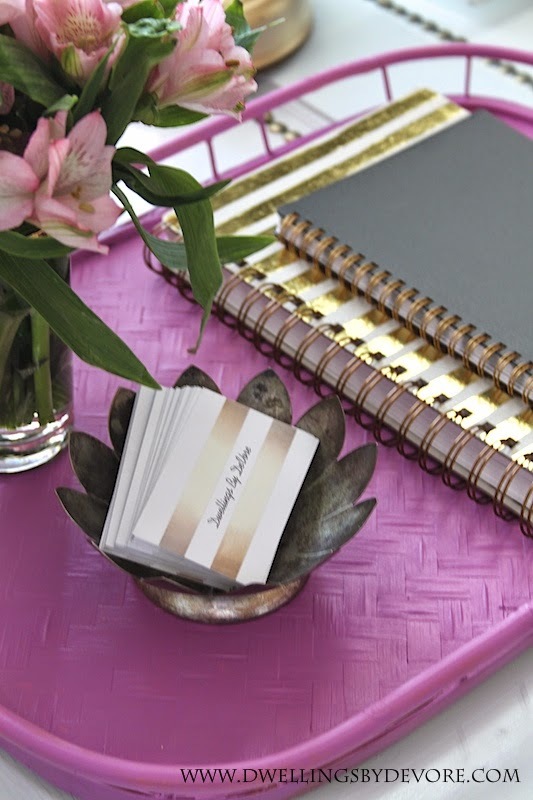 Radiant orchid can certainly infuse a space with energy and happiness even when used super-sparingly ... your tray is a great example. I agree about how far the Pantone sample pot goes (which other paint companies made their sample pots that large and in an easily resealable container :) I recently freshened up (painted) a linen art matt using the sample pot and I have so much left .... plenty for more projects. And that paint is very thick and pigment rich, just saying'. Radiant & fabulous! Bold color used in a simple way. Love the styling too - oh that gold bowl! i never would have thought to do this and i love it- so fun and so perfect on that piece! I have this tray, I should try a small project like this for this lovely color! What a fun idea and such a great way to work in a new color. The tray looks fab!! I love this use of the color! 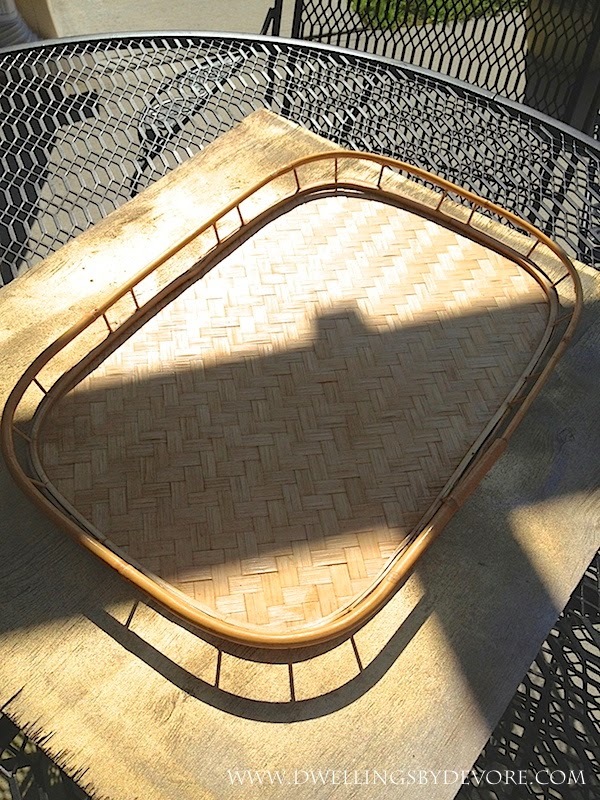 Perfect for a tray - makes it a bold piece but it doesn't dominate anything around it. Perfect! Perfect punch of color for spring - your tray is super cute! Your tray looks great, Bethany. Everything you do is always so, so pretty! We used these trays growing up and I have one at home now and I think you've convinced me to paint it! Great idea and love how you used the color! I am loving that color as well and I find it everywhere in nature this time of the year. That tray is so cute!!!! Thanks! I love the color too, I don't know why so many people don't like it! Thanks so much Jennifer! I'm always a sucker for a good tray, you can never have too many! I see them there all the time. I think I may grab another one next time I'm there! They're so versatile. Thanks Cassie! 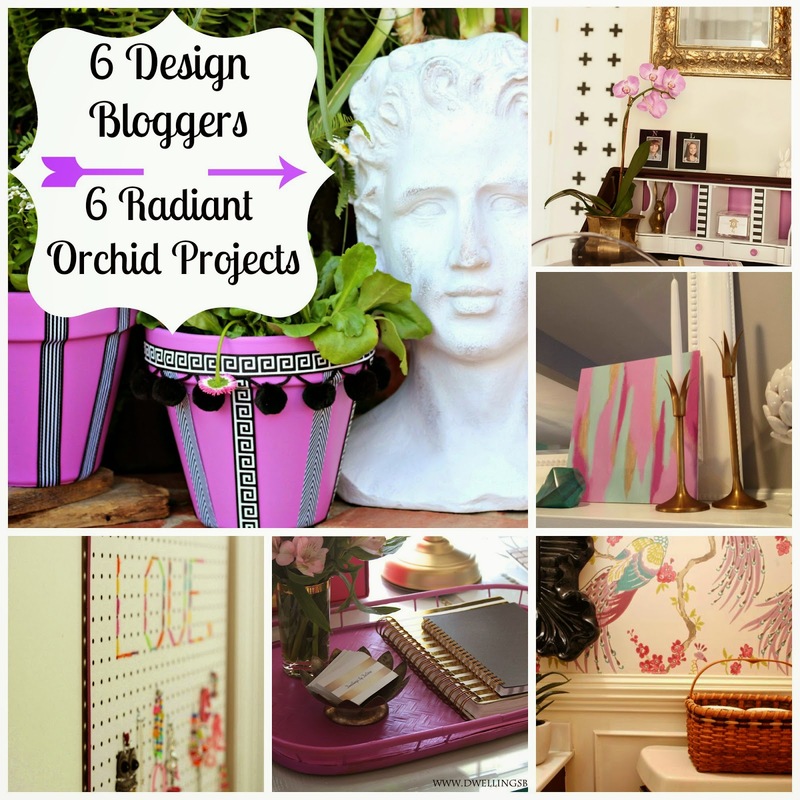 Loved your radiant orchid project too! Thanks Rachel! Someone gave me that little bowl a long time ago and I'm so glad I finally found a use for it! I agree! I was so surprised at how well it covered. It was my first time using their paint but I may just have to try out a few more colors! Thanks Julia! I'm always a sucker for the pretty flowers at Trader Joe's. They're so pretty and inexpensive! Beautiful! I love how you styled it. It's not my favorite color, but I do like it in doses just like this! Hello! 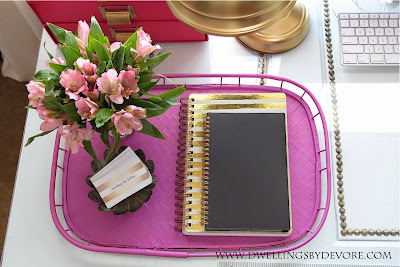 I featured your revamped tray in my monthly blog series, Get Your Color On!. Each month I select a color, provide tips on how to decorate with it, and feature other bloggers with their projects that relate to this color.